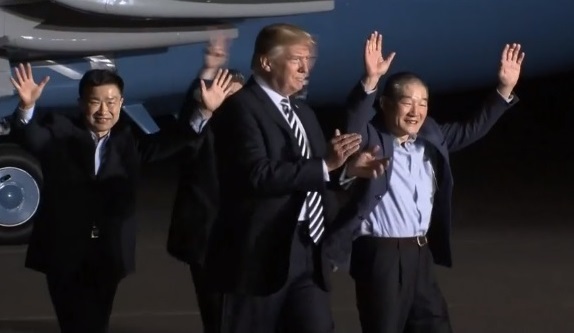 An emotional moment was captured when a trio of American citizens who were political prisoners of North Korea arrived home and was greeted by the President of the United States. The White House said the release of the prisoners was a gesture of goodwill by North Korean leader Kim Jong Un who is expected to meet with president Trump very soon. Kim Hak-song, Tony Kim, and Kim Dong-Chul were three businessmen working in Korea who were accused of espionage by the North Korean government and sentenced to 10 years hard labor. "We would like to express our deep appreciation to the United States government, President Trump, Secretary [of State Mike] Pompeo and the people of the United States for bringing us home," the trio said in a joint statement. "We thank God and all our families and friends who prayed for us and for our return." The president tweeted Wednesday announcing the trio's arrival saying, "I am pleased to inform you that Secretary of State Mike Pompeo is in the air and on his way back from North Korea with the 3 wonderful gentlemen that everyone is looking so forward to meeting. They seem to be in good health. Also, good meeting with Kim Jong Un. Date & Place set." His tweet also referenced upcoming talks between Trump and North Korean leader Kim Jong Un and said the time and place had been set. Wednesday, sources close to the administration told CNN they had been told to prepare for the meeting and it would be in Singapore. In another tweet, the president confirmed that the Demilitarized Zone was not being considered as a venue suggesting the report that Singapore is the location could be accurate. MAGA? or is it MIGA? So happy for their return. Great job! MAGA! President Trump has been successful yet again! I was so proud watching this as it happened! It's amazing to watch him MAGA. So happy for the release of these 3 prisoners! This was another awesome job by the best President, First Lady, VP, and SOS! Makes me proud to be an American having real leaders that put America 1st! Sure beats the embarrassment we had in the prior admin. What a great job from our greatest administration ever. Makes me proud to see our President, 1st Lady, VP, and SOS all there to welcome them back home.